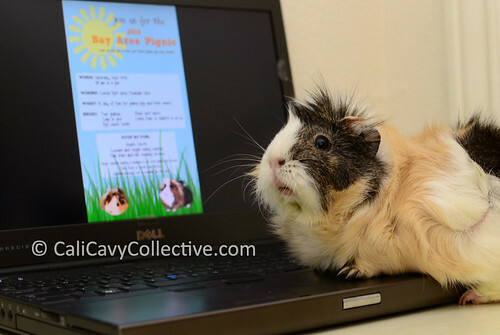 Sharing guinea pig (and some non-guinea pig) related links from September. Have a wonderful wheekend! I loved Penny and the Piggyfriends take on the "This Little Piggy" nursery rhyme. Their guinea pig version made my day! A few peegs may have been woken up by my squeal after I stumbled upon guinea pig socks online earlier this week. They offer two different patterns in pink and green, both of which I promptly ordered. I've been taking advantage of the remaining summer berries by using them in this shortcake recipe. The pigs were only too pleased to help me finish off the strawberry tops. For those who couldn't make it, a recap and photo album of the Bay Area Pignic earlier this month. I would definitely pignap the Abby/himi in this photo set if I had his coordinates. Excited to be photographing the Olympic National Forest and taking in the scenery from the summit of Mt. Ellinor soon. Fingers crossed it won't be pouring buckets. Three cavies exploring their new fleece hideaways. Isn't that tea set the cutest? I love the "This Little Piggy" link!!! When my daughter was little, she used to sing "Enie Meanie Minie Mo, catch a piggie by the toe!" (instead of "catch a tiger by the toe...") which this reminded me of.